When I think unassuming and great neighborhood restaurants, I think Sunshine Cafe. Ignore the fact that a foreign-to-Chicago food writer (Alan Richman) somehow stumbled onto this place. It's on a northern stretch of Clark St. (just north of Balmoral) where until a few years ago, the only foot traffic had to do with people on their way to Gethsemane for flowers. And if you walk by the window and take a peak inside, you might just keep walking and not have any idea what a great experience lies ahead. This is a very simple restaurant, with the faux wood paneling I remember all to well from the 70's and the huge air conditioning unit hanging in back, and yet, it's so very warm, quaint and welcoming, thanks to the owners. The minute you walk through the door, you could not be more welcome. And then the food: if you're looking for the perfect tempura (crispy, non-greasy), or the perfect bowl of Udon noodle soup, or excellent miso, fantastic sukiyaki, teriyaki, salmon -- I could go on and on -- it's all here, including endless cups of wonderful green tea. I have never had anything less than a very good meal, and it never comes close to breaking the bank. And if you're looking for sushi, they'll tell you they don't have it, but they'll happily list a number of places in the vicinity that do. To me, Sunshine Cafe is truly a Great Neighborhood Restaurant . . . unassuming, welcoming, unpretentious and they serve wonderful, home-style Japanese food at prices that won't hurt your wallet. 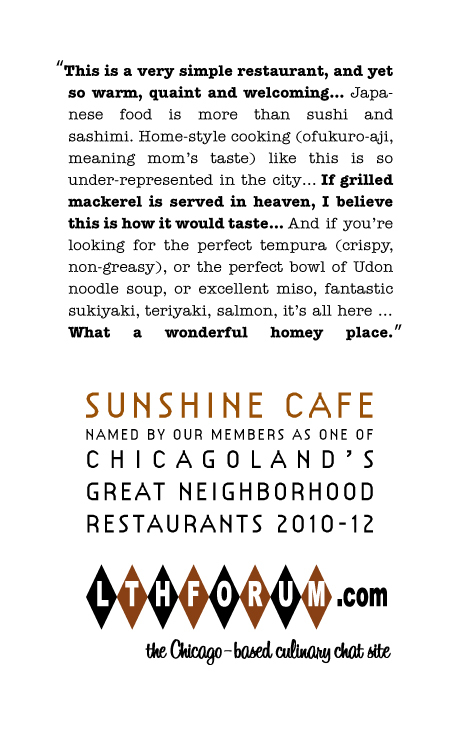 BR wrote: When I think unassuming and great neighborhood restaurants, I think Sunshine Cafe. Sunshine Cafe, what a wonderful homey place. Relaxed, unpretentious, inexpensive, very good food, I heartily second your nomination. i hope sunshine wins because the tres chic sushi scene in this town is becoming sickening. ... just to drum up some support and bumpin' this to the top... i third. TonyC wrote: i hope sunshine wins because the tres chic sushi scene in this town is becoming sickening. ... just to drum up some support and bumpin' this to the top... i third. You and I agree, hummmm, that might be a first. I'm going to Sunshine Cafe for lunch today, Tuesday, at 12:30. Happy to have additional company, the more LTHers the merrier. There are a lot of great restaurants in Chicago . . . and many that I would describe as great neighborhood restaurants . . . but Sunshine Cafe is so unique. They're certainly not trying to be the hippest, and they're not trying to appeal to the sushi crowd. 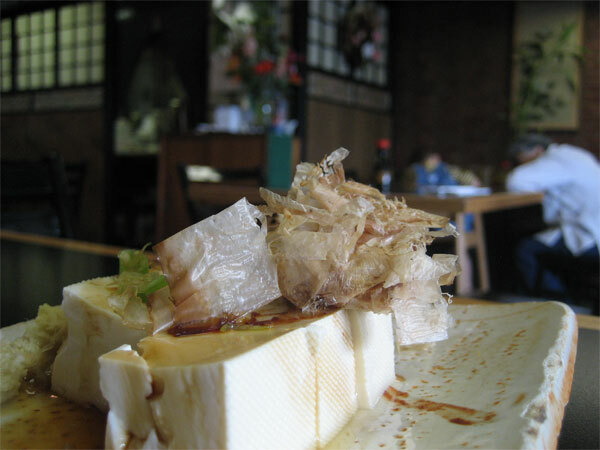 But they are consistently strong in what they do: Japanese comfort food, and that is not a big thing in Chicago. And while I think that there are a lot of very good Chicago restaurants that I'd be sad to see close, a loss of place like Sunshine Cafe to me would be such a tremendous loss (don't panic -- there are no rumors that it would close). It just seems like it's a one-of-a-kind destination and the LTH Great Neighborhood Restaurant program designation seems to fit it like a glove. I'd love to join others there for lunch today . . . but instead, I'll have to find something passable near my Rosemont office location. The first thing I loved about Sunshine Cafe was that the guy didn't think G Wiv's jokes were funny. Okay, that's nothing unusual, heck I do it every day, but it was the way he didn't think they were funny-- this sort of street-smart Chicawgah kind of way of saying "Okay buddy, I'll play along because you're a customer, but don't push it." Which is nothing unusual in Chicago, except for the minor detail that the guy giving him that South Side attitude was Japanese-American. Which makes the point that Sunshine Cafe is a little slice of living history. Well, that's not that unusual either, part of what we all love about dining out in Chicago, I think, is the way it lets us time travel, both in history (have breakfast in the 50s, lunch in the 70s, dinner in 2025) and in our own lives (eat breakfast like you're 70, lunch like you're 12, dinner like you're yourself but fancier). But there's history and then there's History, and one example of History is the fact that Japanese-Americans came to Chicago in the 1940s because it was somewhere they could leave the internment camps of the west coast for. When I moved to Lakeview north of Belmont in the late 80s there was still plenty of that community around that area; it's almost gone now except for a few spots like Hamburger King. But where most ethnic restaurants are run by first-generation immigrants, a, a place like Sunshine Cafe stands out because it shows you a community that's been here for decades, maintaining Japanese traditions and foodways and yet as American as the Dodgers, Frank Sinatra and hey buddy are you gonna order already or you just gonna flap your trap all day? Sunshine Cafe is the kind of corner restaurant you find all over America where cops and grandmas and dolled-up teenagers and gay guys with spiky hair cross paths, a place that couldn't be more American and yet a place that lets you take a half-hour break in a completely different culture. I'm glad the nomination of it for a Great Neighborhood Restaurant award made me go there today, and I enthusiastically second it as one of the little cross-cultural (and cross-temporal) treasures of our restaurant scene. Mike G wrote: The first thing I loved about Sunshine Cafe was that the guy didn't think G Wiv's jokes were funny. The guy loved my jokes, you just couldn't tell 'cause he's inscrutable. Lunch was terrific, simplicity rules. Crisp skin, meaty flesh, pockets of richness reminiscent of grilled yellowtail collar, I may dream about the salt grilled mackerel it was so delicious. Miso soup may have been the best I've had in years, once again, simple, fresh, dashi made in-house from first rate dried bonito flakes and kombu. Terrific GNR nomination, I almost went back with Ellen for dinner. Sunshine Cafe's grilled mackerel was so delicious Tuesday, I went for lunch again today. The mackerel was, if possible, even better today. The rice ball with umeboshi is called an onigiri. 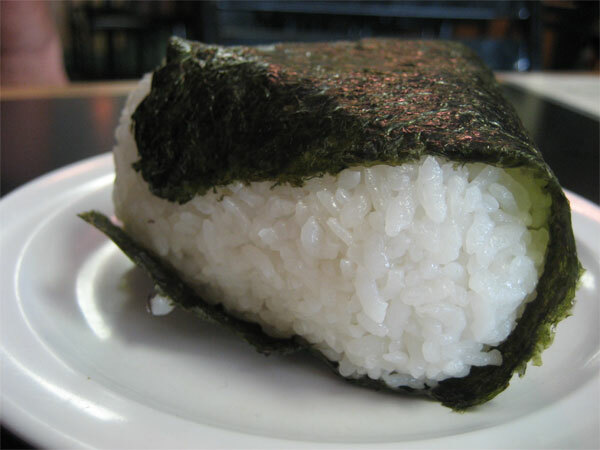 Onigiri is truly Japanese home cooking; it's really unusual to see this served in a restaurant. Sunshine has been around, I think, since the mid 70s? Hamburger King has not been Japanese owned for quite some time. I believe Toguri is the only Japanese owned business left in the Belmont/Clark area. Your lunch looks and sounds delicious! In my nomination, I didn't even mention the mackerel which really is so perfect . . . salt, crispy skin and yet so amazingly soft. Thanks for the wonderful pictures and descriptions. Of course, they still don't do Sunshine any justice. 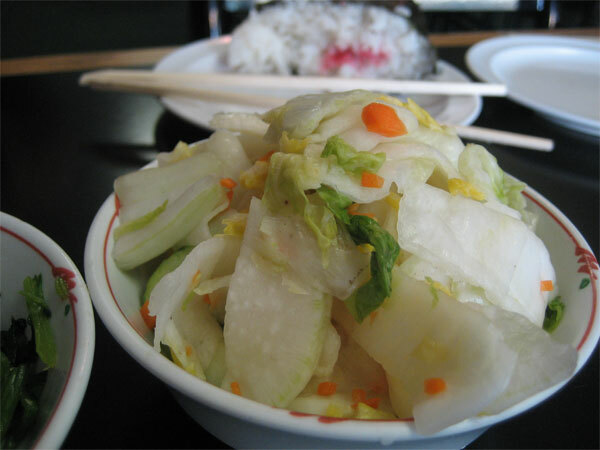 pickled stuff = generally "tsukemono"
"Toguri is the only Japanese owned business left in the Belmont/Clark area." Another that is so obvious you miss it is the full-menu Japanese Matsuya. It doesn't get much love here, and not everything is great, but it is the Nisei pillar. If the main guy is behind the bar, you will be steered right, particularly if you show an interest in things such as natto and saba (my favorite in Chicago). Extended Japanese families still fill out the place, between the tourists, kids and punks, as has always been the case. It's a sentimental favorite. I really love these kinds of places, and Sunshine is a great GNR. My hapa Japanese (half-Japanese) friend who grew up in Hawaii introduced me to this place. My initial thought was that this place is SO Hawaii, but that is probably because I didn't grow up in the Japanese-American community. There was something very nostalgic to me about the restaurant and the clientele, even on my first trip there. I was kind of surprised that so many guests were enjoying foods I don't usually associate with Japanese restaurants, but its lack of pretention is a very nice change of pace. It's the kind of restaurant that makes me want to be a regular there. In fact, I think I'll go there for dinner tonight. Thanks for reminding me to Sushine Cafe, and I second (or is it eighth) the nomination! I went to dinner at Sunshine Cafe with CrazyC, Helen and my exercise teacher Susan (yes, I am a corrupting influence!). I had invited CrazyC because I was hoping to get some tips on the menu as well as enjoy her company. I quickly learned CrazyC has never gone beyond the mackeral because she loves it so much. Almost everything everybody else had was new to CrazyC relative to Sunshine Cafe. Helen ordered the tempura dinner, whose batter style she didn't find to her liking. I order sukiyaki, which once I got it remembered it wasn't exactly my favorite dish in the world. This was decently prepared, though I had wished I had ordered something else. Fortunately Susan ordered the Steak Teriyaki, which she effectively shared with me. It was soooo bursting with flavor! CrazyC also gave me a sample of her mackeral, which I found to be worthy of ordering next time, though I usually don't like mackeral. There is something about char-cooking mackeral which transforms it from too oily a fish to just right. CrazyC and others commented on that several years ago after a lunch near the Tokyo Hotel. We all loved the pickles and especially the goma-ae, which we ordered a second round. While Japanese restaurants always have a reputation in my experience of being somewhat expensive, this is certainly not the case at Sunshine Cafe. As someone who has a sense of history, I found the earlier discussion linking this place to WW2 very interesting. I was very pleased to find the Sunshine Cafe thread had quite a number of enthusiasts though I had largely not heard of this place before. I am pleased to join the enthusiasts in their praise. When Sunshine Cafe closed for a time, I mourned its passing. I thought I would never again be able to taste the home style food they they had been turning out for years. In particular, the grilled mackerel left a hole in my heart that couldn't be filled elsewhere. The fact that they reopened and haven't missed a beat in their food prep was one of the highlights of last year for me. I strongly support the renewal of Sunshine Cafe. I would like to give my support in the GNR renewal for Sunshine Cafe. I have always enjoyed the quality of the food and don't think it suffered at all from its hiatus. There is nothing like a big bowl of noodles, broth and vegetables to warm one's soul! stevez wrote: The fact that they reopened and haven't missed a beat in their food prep was one of the highlights of last year for me. I strongly support the renewal of Sunshine Cafe.
. . . one of the highlights for me too. And during this seemingly endless winter, Sunshine Cafe has given me great comfort. Definitely worthy of GNR status. I admit to only going once, but it was after the initial GNR, and the grilled mackerel was a delight. A simple, unassuming place turning out impeccable food in a style not easy to find elsewhere in Chicago. A GNR in my book. We haven't been recently (shame on us), but the number of times that we've been since the awarding of the GNR should qualify us to vote in the affirmative on this one. Pace the unfortunate (and hopefully unique) instance of a less-than-warm welcome recently noted elsewhere, we have found that Sunshine Cafe continues to be a cozy neighborhood place serving up wonderful, dependable Japanese comfort food. We heartily endorse its renewal. Sunshine Cafe is, was and continues to be one of my favorite spots in Chicago. Two thumbs up for GNR renewal!. I get all warm and fuzzy when I think of Sunshine Cafe. I've probably had a half a dozen meals there since the last renewal period, and it's been as wonderful as ever. I'll second that. I'm a huge fan of Sunshine Cafe. We continue to go on a semi-regular basis since it's too close not to visit and, as always, the quality of the food, the warmth of the room and the welcome make it a no-brainer in our humble estimation. Four thumbs unreservedly up. Delicious, comforting food in a warm, inviting environment. Renew! Renew! Sunshine is an easy walk from my house and a regular stop recently. The front of house staff always makes me feel like I'm at their house for dinner, and the food itself is delicious, inexpensive, and light, yet deeply satisfying. 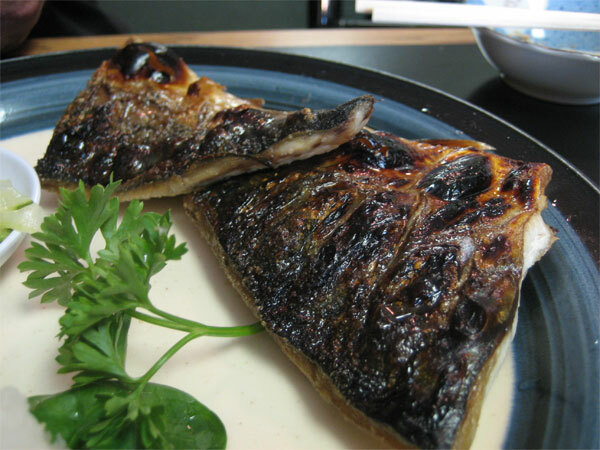 The broiled mackerel is my go-to order, though everything I've had on the menu has been good. Count me in as a supporter of Sunshine's GNR status. Grilled mackerel, noodle soups, and tempura are all just well prepared and scratch the itch for traditional, cooked Japanese food. If I'm in the neighborhood, and I don't wind up eating here, I regret it. This is an absolute renewal in my book. Sunshine Cafe is a favorite, love the grilled mackerel, the homey feel, conversation with Paul the waiter and, most of all, I am deeply in love with owner Joni Ishida, the Japanese grandmother all of us wish we had. Sunshine Cafe, count me a fan. My go to for traditional Japanese. Reminds me a bit of the izakaya I worked at in Ichinomiya, complete w/obachan (grandmother).